Next week is the start of the 4th season of HBO’s Game of Thrones. I am typically not a fan of this type of genre. Thought the Hobbit was OK and didn’t like any of the Lord of the Rings. Just not my style. Yet something attracted me to Game of Thrones that made me a fan. 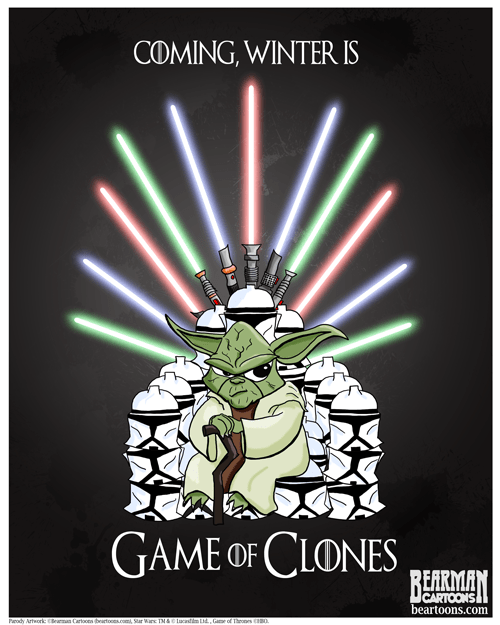 And of course I always loved Star Wars so “Game of Clones” was a perfect parody mash-up of Yoda sitting on a throne of Clonetroopers (as opposed to Stormtrooper) helmets and Light Sabers. True fan boys will probably tell me I was off on one or the other but I claim artistic license. I’ve never watched Game of Thrones, but I like your poster and promise to watch your series. So when will it be on? I am looking forward to the start of the new season since I have just started playing the game! I’d not even heard of this show until this post. I’m not much for television and only watch a few things. Hubby loved Lord of the Rings. Not my cup of tea either. I went into another room and read. I did like all the Star Wars too. My son was growing up during these movies and I took him to every single one of them and waited in those very, very long lines. Great drawing, Bearman. I love the lightsabers in the background! I don’t watch much TV so I haven’t seen Game of Thrones. Thanks. Took me a while to get the glow the way I wanted. Whoa. Amazing effects on the lasers, mirror image of Yoda and just funny as hell. Is it me or does it bring out the old Weird Al song ‘Yoda’? Been vacillating on purchasing Game of Thrones. Have heard SO many great things about the show. Don’t get HBO -am one of those cutting the bale types with a Roku- and Game of Thrones will NEVER be released on Netflix or any other pay per view. So sayeth HBO and the creators. $39.00 a season in HD. I don’t think I heard that song. Going to have to look it up. Bet you can get it 2nd hand used on ebay. Seems after a while they will even drop in price retail. Shall put Game of Thrones on my mental wish list then. Saving my ducats for a necessary large expenditure first. Then… I shall catch up with the cool kids! My Goddess, have only just finished the third episode and am enthralled. Simply hooked like a fishie! Cool. Get moving. 3 seasons is a bunch in a week. Yoda is my favorite and I have been collecting Yoda merchandise since the first figure was launched. That’s a great drawing! Well done! Pretty sure you don’t want to mess with him. I’m really surprised but I am a huge fan of “Game of Thrones”. Love it! I also really love this piece. That is a lot of work but so worth the result. Thanks Michelle. I am very happy with it too. Love this show and can’t wait. Love the drawing too! Cool artwork, bearman. I’ve seen some of the episodes but haven’t been able to keep up with it. I like what I’ve seen though. This is super awesome. You should make a whole comic book out of it. As yoda would say, “Coming, winter is”. Oh wow, I saw this on Tumblr but didn’t know it was you. This is my favorite this on the internet right now. Woo hoo. Wait, you didn’t know it was me? My giant corner logo didn’t give it away? Oh I like this! I like this a lot! I think if you made this a t-shirt you’d sell then like Star Wars logo’d hotcakes! Game of Thrones is so good because it’s so well done. They spared no expense and the writing and acting are magnificent. I haven’t seen “Game of Thrones” but I love the image. Well done! I just got finished a few minutes ago with season 3 episode 6 for the 2nd time. I am going through season 3 this week since it has been a year since I watched it, so that I will be ready for season 4. I can’t get myself to sit down and read a 1000 page book or however long they are. I like your Game of Clones better than the post I titled the same at 8-bit Nerds. Both are good but your’s is better. I just finished the available books, so I am going to binge watch this show right after I finish my Son of Anarchy binge. I would watch that so hard my TV would explode.